Another short flight although this time down to Gibraltar. With the sands of Africa trying to peek over the Horizon it was tempting to head further south and tackle the biggest continent on the planet. There will be plenty of time to work through Africa later on this trip but for now I was concentrating on a tiny spit of land on the southern tip of Spain. Although on the coast of Spain, Gibraltar is still owned by Great Britain. 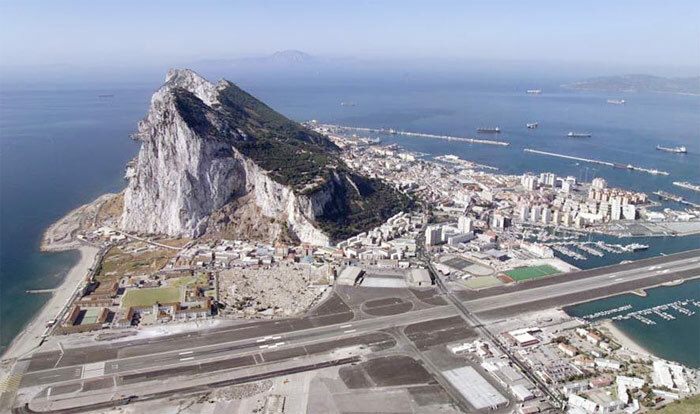 The Spanish are not so happy about this and just to make life difficult, they insist that any aircraft landing in Gibraltar are not to cross into Spanish air space. This means aircraft can only approach from the south and have to perform a very tight turn in order to successfully land on the rather unique runway. My small aircraft didn’t have any problem with this however I would imagine a larger passenger plane would be under much more pressure. Pointing my plane at turquoise shores I soon saw the impressive Rock of Gibraltar rising up from the sea on one side of the runway and the city itself on the other. It is interesting to note that the land is so narrow here that the road connecting the north to the south runs right through the runway. As aircraft land or take off, a set of barriers close the road much like any railway crossing. I have no idea what the safety records are like but it did make me wonder. The views from the Rock of Gibraltar are fantastic giving a full view of the city to the north and the African shores to the south. Just be careful of the local inhabitants. The monkeys can be a little fearless at times. The Rock of Gibraltar and the road through the runway.